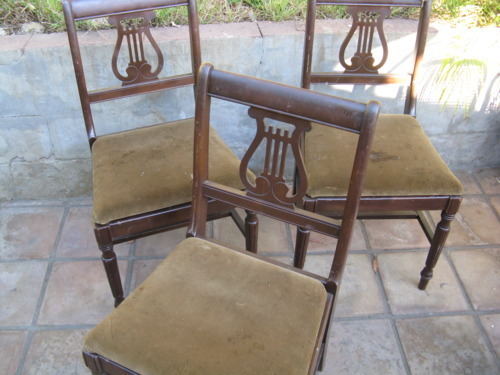 ery happy to relate our latest makeover story, which we call a tale of three chairs. A family member gave us these chairs for which they paid about $2.50, knowing we could rehabilitate them and return them to society, clean and sober. They suffered from neglect, a sad dark brown paint job and unfortunate brown velvet cushions. 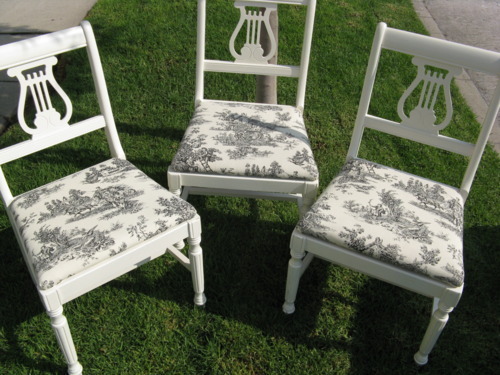 A couple of cans of antique white spray paint and some black and white toile fabric later, you see in the second photo the fully re-imagined chairs, fresh, clean and ready for their close up. Price paid for the trio at our yard sale today: $115.